Located just outside of Lebanon City, this 153-acre park offers camping, picnicking, hiking, and a 23.5-acre lake for canoeing and fishing. Known locally as a prime destination in early spring for the opening day of Trout Season, you can visit year-round to spot deer, rabbits, herons, osprey, and grey-horned owls. Walk along the 1.5-mile trail that encircles the lake then visit at the Nature Barn, a 125-year-old farm barn featuring a large variety of displays of field and fauna. 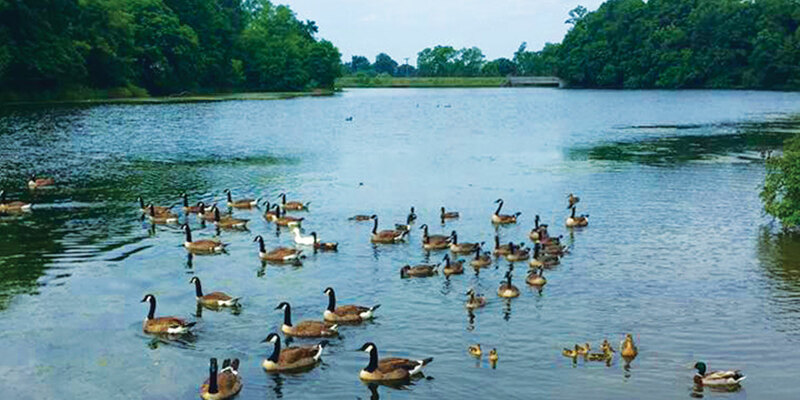 This city owned park is located at the Northeast boundary of Lebanon City and North Lebanon Township, and features a 23.5-acre lake, inside a 153-acre park. The park has (4) four entrances, one at East Maple St. & Stoever St.; one at East Maple St. & North 3rd. Ave.; one at East Maple St. & Theater Dr. and one at Miller St., which can be reached either by North 8th Ave., or North 7th St. (Rt.#343) and following the signs. The Stoever’s Dam Park offers it’s visitors; two softball fields, community garden plots, interpretive nature trails, fishing, boating, a camping area (primitive sites) for tents and RV campers, (camping overnight by permit only), picnic areas with benches and fire rings, a covered pavilion which can be reserved by calling the City Recreation Department, wetland areas for nature observation, a walking path that goes around the lake, and a nature center. The history of Stoever’s goes back to the 1700’s, and can be traced to 1821, when Abraham Light, the grandson of the original farm owner Martin Light, sold the farm to John Stoever, from which the dam gets it’s name.Northeast section of the Lebanon, with entrances on north Third Avenue, Miller Street and Stoever Street. With 156 acres, the park features a Nature Barn, Community Theatre, picnic and camping areas, pavilions, boat ramps, fishing, handicapped fishing area, two softball fields, nature trails and memorial arbor.